Notes: Produced by GONZO, co-produced by AIC. 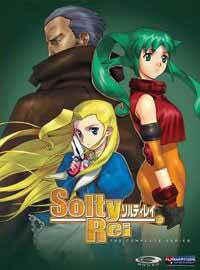 A manga adaption, SoltyRei -The Red Lady-, written by Noboru Kibuya and illustrated by Takimiya Kazutaka, ran in Comic Rex from 2005 to 2006. Two DVD-only bonus episodes were made after the series ended its run. They take place in the middle of the series. They are not accounted for in the review of this series. Twelve years ago, lightning stroked the top of the R.U.C. (Reestablishment Universe Committee) building. This incident, known as the Blast Fall, killed many people and severely injured many others. Some of the people who survived are now Resembles, humans who have parts of their body replaced with prosthetic body parts as a result of the explosion. Among the causalities was the loss of bounty hunter Roy Revant's daughter Rita, who disappeared when the Blast Fall occurred. He still thinks she's alive, but in her absence has become a grumpy, gruff middle-aged man, making a living as a notoriously violent bounty hunter. His life turns around when he saves a mysterious green-haired girl, who grows fond of him and even lives with him; she's given the name Solty Revant. A Resemble herself, Solty is much more than she seems. If there's one thing I've learned as a reviewer, it's that prejudice to certain companies' work can sometimes blind you from watching great series. In my case, I have studiously avoided reviewing shows from animation studio GONZO until a while back. While I've liked a few of the shows they've produced, I've avoided the grand majority of them as if they were on fire. Anyway, on a whim I decided to pick a title from GONZO and watch it all the way through. That series was Solty Rei, a 2005 action series. And while it's not the best anime ever, it's definitely very watchable. Unfortunately, all too sudden the series forgets that the series is called Solty Rei, as the series fluctuates back and forth between three different sets of characters. In addition to Solty, Roy, as well as his cheerful boss cheerful Miranda Maverick and her blunt, intelligent daughter Kasha, we have two other groups of characters the series focuses on like a game of musical chairs. The first is the Anderson siblings, which is made up of two guys and one girl. The sole girl, and the youngest of the trio, is Rose Anderson, a thief who steals to support those who live the poor life underground like she does. She's bossy, selfish, demanding, and irritating from her debut until her leave, forcing herself into Roy's life and even living with him, with little to no regard of his feelings on the manner. Her character leaves halfway through the show after a convoluted revelation is made concerning her, only to come back later in a different form. Her brothers, Larry and Andy, have a partial amount of screen time in comparison. Which is fine, since they're pretty one-note characters: Andy is the energetic, hot-tempered one with a knack for computer hacking (which is hard to swallow considering how he usually acts), while Larry is the leader and oldest sibling. He's also a self-proclaimed ladies' man of sorts, as we learn in the DVD-only episode. The other group consists of our villain, the cold, scheming, undertone Ashley Lynx, and his four female subordinates referred to as PROCEED: Integra, Slyvia, Celica, and Accela. (Yes, they are named after Japanese cars.) Integra is the responsible, serious leader of the group, Slyvia is feisty, hot-tempered, and has a crush on Ashley, Celica is a laid back sniper with tanned skin, and Accela is the youngest, quietest member of the group, looking out for the others as the information specialist. The girls have little role in the story at first, but as the series goes on and gets more interesting, they start to stand out more (especially Accela, who plays a major role in the last quarter of the series). Speaking of the story, now is as good a time as any to talk about it, I suppose. Early on, the series, aside from the first episode, is actually fairly light-hearted a lot of the time. A few of the initial episodes deal with Solty and her learning as a person: making friends, her first check up, learning to cook, celebrating Roy's birthday, and so forth. We are also introduced to the main cast, which is comprised of the above people plus Yuto Steel, a techno-geek with a crush on Solty (which rubs both Roy and Kasha the wrong way, resulting in him being called a pervert). By episode 12, though, any goofy nature the show had is gone. Solty Rei then begins to go back to elaborating more on the Blast Fall, as well as the evil scheme of Ashley's. Friends become enemies, enemies become allies, people die, and Solty even leaves Roy at one point and heads out on her own! While it's not a dramatic change of pace, it is still noticeable, especially when six episodes ago the cast was in a filler episode in an indoor pool. The next thing you know, though, you're watching Integra and Slyvia hunting down Resembles. We also get into the backstory of the events that occurred up to the Blast Fall, as well as the city itself dividing itself into an above surface and the underground dwellings for unregistered people. Truth be told, it's done very well. Unfortunately, the action scenes and plot twists are marred by predictable outcomes and too many conveniently timed events, hampering the dramatic mood. While Solty Rei never gets bad at any one point, it instead fluctuates between great and mediocre, which isn't much better. I don't know if series director Yoshimasa Hiraike (whose only other major directing role was Kaleido Star's second half) or screenwriter Noboru Kimura (whose earlier works include "classics" like Zoids: Fuzors and Bottle Fairy) is to blame, but Solty Rei's could've stood for a little more script revision before being shipped out to air. Fortunately, the art and animation don't suffer from inconsistency or a lack of polish. It's obvious that GONZO had a hand in the art, because the CG is great, as is the animation when it needs to be. Character (Solty aside) look refreshingly normal for a series that takes place in the "future" (normal = lack of garish hair colors / hair styles). And with the exceptions of Rose and Slyvia, the fairly big cast is easy to tell apart. The music is pretty decent, and contains quite a few insert songs sung in surprisingly clear English, a rarity in anime. The opening and ending themes, which are okay, are sung in Japanese. I didn't listen to much of the English dub from FUNimation, but the Japanese cast does a good enough job. The cast is voiced by many prolific anime voice actors and actresses, with the PROCEED girls getting the biggest names, such as Mamiko Noto and Yukari Tamura. On the main character side, Momoko Saito (Tsuyuri, Doujin Work) provides the voice of Solty herself, Masumi Asano (Hafuku, Ikkitousen) Rose, and veteran actor Jouji Nakata (Alucard, Hellsing) plays Roy. On the mother-daughter end we have Sayaka Ohara (Alicia, Aria) as Miranda, while her daughter Kasha is voiced by Natsuko Kuwatani, who reuses her voice from earlier that year that she used as the also blunt, somewhat serious Yue from Negima. Overall I liked Solty Rei, but the predictable, annoying cliche in the second half, as well as the irritating Rose, bring down the show a lot for me. While I definitely prefer the series to most any other GONZO material, it's still a decent show at best, saved by good production values and a likable heroine. Recommended Audience: Teenagers and up, due especially to the violence, which can get quite messy at times. Some parts of the series might also be considered too thematic/problematic for younger children to watch.